What can you tell us about your new release Sleight of Fantasy? 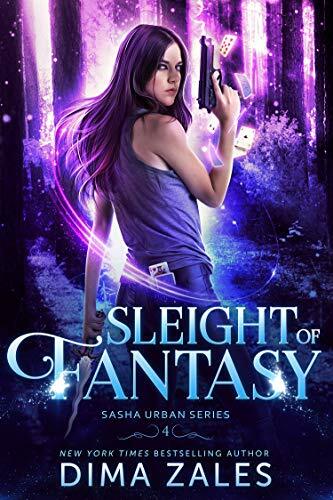 Sleight of Fantasy is the fourth installment in my Sasha Urban series, which follows a young illusionist living in NYC who discovers, after a performance on national television goes terribly wrong, that she possesses very real magical powers. In Sleight of Fantasy, Sasha is finally mastering those powers, while trying to cope with mysterious enemies bent on destroying her, her growing attraction to her boss/mentor, as well as some life-changing revelations about her family lineage. I’ve always loved reading, and writing is a good next step for book lovers to take, in my opinion. Brandon Sanderson, and I would suggest he clone himself so that his books can come out even faster! I love the creative process, especially brainstorming, etc. I’m constantly coming up with fun new ideas, and fleshing them out into full-blown novels is exciting to me. I write, work out, go on walk with my wife, romance author Anna Zaires, during which we brainstorm what we both want to write next, edit what we wrote, do some publishing logistics, go on a bike ride with Anna, and wind down with a little TV. What scene in Sleight of Fantasy was your favorite to write? This book takes place in a world inspired by Russian folklore, so I love writing anything that incorporates these legends I heard as a child.